As one of the premier providers of residential and commercial appraisal services in the Copperfield market, our Texas certified appraisers can help you with values for both private and banking use. Our goal is to deliver a quick, reliable and comprehensive appraisal report that meets our clients’ expectations perfectly. Not only do we turn around our appraisal assignments faster than typical appraisal companies, we maintain some of the best fees for appraisal services in the market. Our roster of appraisers are all local to the Houston area and are competent in appraising for various property types, for any purposes including residential, commercial and mixed-use properties. If you have a commercial property that needs valuing our staff of Texas Certified General appraisers can provide you a quote based on the project details. Moreover, our appraisers are able to provide appraisal services for any use including financing, private issues, insurance, legal issues and any other scenario that requires an concise and reliable property value. Whether you’re a homeowner or an industry veterans, we are dedicated to providing a courteous and reliable service. Should you have questions, or do not see the exact service you need, you can use our online contact form or call us directly at the number listed on this website. Getting a quote takes minutes! 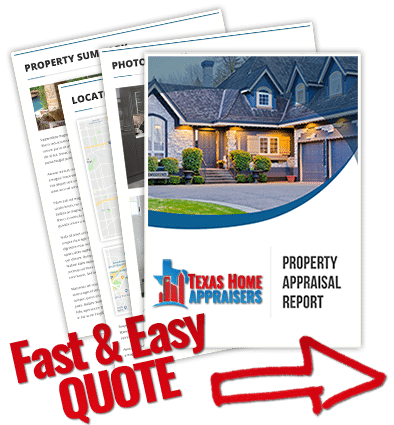 Just submit the online quote request form or ring our direct line and one of our licensed houston home appraisers near you will be delighted to discuss your appraisal needs. Do I really need a real estate appraisal? There are many reasons to require real estate appraisals but the most important is the fact that real estate makes up a large portion of the economy so it’s accurate valuation is extremely important to the overall health of the markets. Real estate appraisers utilize many different methods to determine the current market value of a property. The appraiser’s professional opinion acts as a hedge against risky investments or purchases within current market trends. Due to the risk involved for borrowers and lenders, the appraiser’s opinion of value reduces the possibility of overpaying or over lending on the purchase of real property. How do floodplains impact an appraisal? One of the most difficult scenarios for appraisers in the lack of recently sold comparable properties. The typical acceptable window for comparables is six months but the appraiser may need to go further back in time and adjust for the age of the sale, or go further out to find a comparable neighborhood that has recent sales. Any of these methods are acceptable appraisal practice but since they are out of the “norm” is usually raises red flags with lenders. The appraiser is not a whole house inspector, engineer, architect, electrician, plumber, HVAC technician or contractor. While the inspection is taking place, the appraiser should take a mental note of what the subject property backs and fronts to. If the subject property has a negative view, such as a powerline or commercial view, the appraiser will search for at least one comparable sale that provides the same view when doing his research. An appraisal is not a guarantee of condition. The appraiser will ask about any visible problems and those which may not be visible, and will do his/her best to gauge any impact on value attributable to those problems. In certain cases, if you feel your home has external or internal damage that may be unapparent to the visible eye of an appraiser, you may be prompted to seek the advice of a real estate inspector.